With message recall, you can retrieve a message you sent from the recipient’s mailbox who haven’t yet opened it. For example, if you forgot to include a piece of information you can try to retract the message and then send another message that has the missing information. 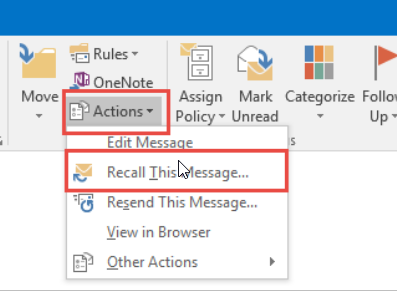 Message Recall is available after you click wend and it’s available only if both you and the recipients have a WorldPosta mail account in the same organization. 1. In the folder pane on the left of the Outlook window, choose the Sent Items folder. 2. Open the message that you want to recall. You must double-click to open the message. Selecting the message so it appears in the reading pane won’t allow you to recall the message. 3. 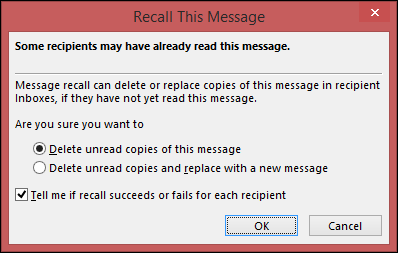 From the Message tab, select Actions, then select Recall This Message. 4. Click Delete unread copies of this message or Delete unread copies and replace with a new message, and then click OK.